Thought and behavioral patterns, established over decades, are deeply ingrained in our minds. Most often, they rule us while hindering our natural growth and expansion. Our unique event experiences provide entry points and powerful pathways to human potential development. We emphasize key prerequisites to all personal change: Awareness, Desire, Visualization, Integration and Practice. 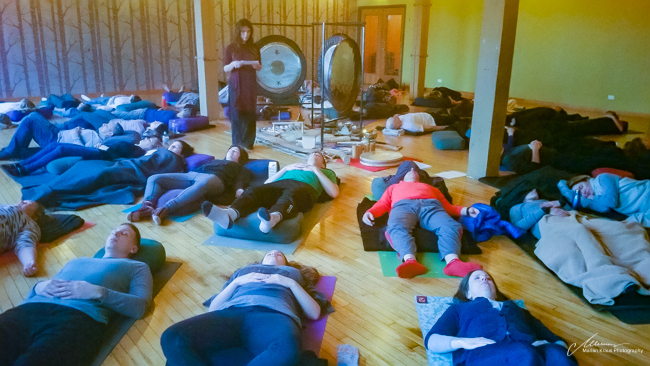 sound session where guests are immersed in a bubble of ancestral and otherworldly sounds generated by gongs, one of man’s oldest therapeutic instruments (a.k.a. gong bath, or gong bath meditation). The sound spaces we create resonate all 50 – 65 trillion cells of the body, and energize and relax simultaneously in a most powerful and unique way. You will immerse re-balanced, detoxed and and re-rejuvenated. Read more at FAQ. All are custom tailored experiences and we offer suggestions on how to naturally blend with the requirements of your specific event. Unless otherwise specified, each features the three stages highlighted in the "Group Experiences" section and requires a minimum of 20 participants. Read more at FAQ. Introducing the customized Delamora Transformational Experience at large corporate functions, trade expositions, festivals and the like provides an extraordinary and memorable encounter that surprises and delights all who come to feel the meditative, relaxing and inspiring vibrational presentation. Our unique concepts are ideal for incorporation into 3-rd party organized small to large group experiences, guaranteed to provide a striking differentiation from the common.